Restore the beauty of the Magic Gardens! 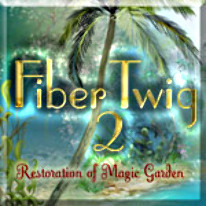 The long awaited sequel to Fiber Twig is here, with intriguing characters and challenging puzzles. As before, your mission is to help the charming inhabitants of fairy kingdom, by restoring twigs to their original pattern after it has been destroyed by a hurricane. Enjoy new features, such as the ability to select a helpmate - including a Knight, Enchantress or Goblin - and upgrade the character's skills in seven areas during the course of the game. You will also learn astonishing facts about the fairy creatures who inhabit each game level. Enjoy this genuine treasure of a puzzle!